Repairs and Services is a large part of our business and we pride ourselves on doing quality repair work at fair and reasonable cost to our customers. 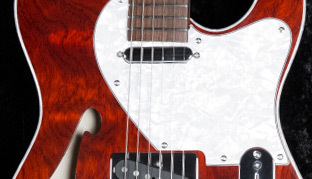 We work on all makes of electric guitars and basses as well as acoustic guitars. We provide a written estimate of repair cost in advance of doing repair once the instrument has been inspected. Our turnaround time on repairs is very good. Please call for an appointment before dropping off repair work. 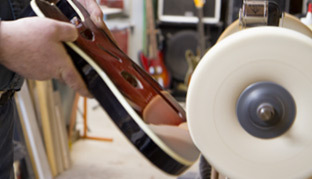 At Legend Guitars, we are able to refinish almost any guitar and restore its' appearance. We do all types of guitar finishes from solid colors, metallics, translucent colors, two color bursts, three color sun-bursts, tobacco bursts and sparkle finishes. We use a high quality catalyzed polyurethane lacquer for the clear coats as well as a quality sanding sealer for sealing the wood. We also use Nitro cellulose lacquer on some guitars at the customer’s request and are usually because it is a vintage finish for a vintage guitar refin. These industrial finishes are specifically designed for use on wood only and are very durable finishes. We spray as many as 15-20 coats of finish on each guitar body we build or refinish. Our finishes are thick, deep and flawless and are machine polished to a "glass-like" high gloss luster. As well, our necks can be finished in either a high gloss or smooth satin finish in either a natural or vintage amber color tone. We take great pride in our finishes and feel it is the most important aspect of building a great looking guitar. Contact us for a price quote. 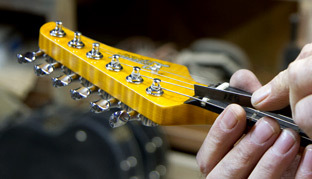 At Legend guitars we do all types of fret work on both electric and acoustic guitars. We re-fret necks with binding and necks without binding. We repair worn fingerboards and resurface fingerboards as well. We also re-fret and refinish maple fingerboard necks and are pretty good at matching amber aged finishes. We also do fret dressings to remove fret wear. We do not hammer new frets in place but rather, press them in place using a fret press which gives superior results. With our re-fret work, after removing the old frets, we resurface the fingerboard to the correct radius, radius the fret wire to the same radius as the fingerboard and then press in and glue the new frets, clean and oil the fingerboard and buff and polish the fret wire to a high shine. At Legend guitars we do all types of wiring work on both electric and acoustic guitars. Wiring repair requires diagnostic assessment to determine and pinpoint problem areas and is not always easy to find and correct. Therefore, there is a minimum charge for diagnostic work ( usually a one hour labor charge). No repair will be completed until the diagnostic assessment has been completed and the customer has been notified of the problem and cost to repair. We also wire in new pick-ups, switches etc. and make custom modifications. 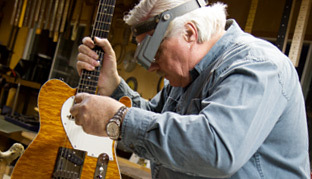 At Legend Guitars, we also repair and restore many different types of guitars. Aside from those services noted above we do body repair, nut replacement, parts replacement and much more. We can also supply you with a new neck (we keep an inventory of about 25 guitar necks of various styles ) or a new guitar body, finished or unfinished. We use a large industrial pin-router for all our routing operations for consistence and tolerances of 1/1000 of an inch. We repair broken headstocks, binding repair, body and neck repair, acoustic bridges/saddles repair, new nut replacement, acoustic internal bracings repair etc. 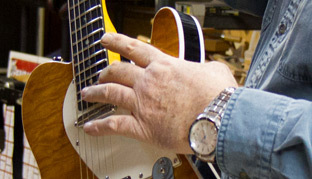 We also specialize in repairing and restoring vintage instruments. Having a guitar that does not play well is not only frustrating but aggravating. Often, all many guitars need is a good set-up to get them playing well. Our set-ups can include truss rod adjustment, saddle height adjustment, intonation adjustment, nut adjustment, pick-up height adjustment neck tilt adjustment and tremelo tension adjustment. 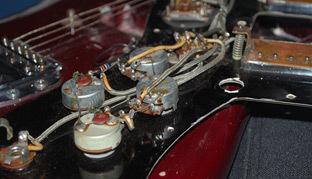 Set-ups vary in cost depending on how much work is required and usually requires an inspection of the guitar. One of our specialties is restoring vintage instrument. We have done many over the years and produce outstanding results. A great deal of effort is put into bringing these old vintage guitars back to their origional glory. Often when these guitars come to us they are in such bad condition that they have very little value left in them as they currently exist- what we do is restore them to a condition that makes them extremely valuable in the vintage guitar market. Using our Rockwell RU 50 Industrial pin router we have the ability to make any type and style of pick guard. We have many templates in stock for routing pick-guards and as well can make custom templates for routing custom pick guards. 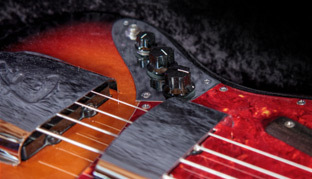 We also stock a variety of sheets of pick guard material for making pick guards. 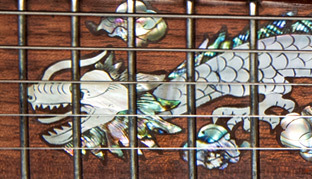 At Legend Guitars, we also do custom designs and inlay work of vines and flowers, birds, etc., using exotic wood veneers, "mother-of-pearl" and "abalone shell" on guitar neck head-stocks, pick-guards, neck fingerboards, etc. Price on this type of work is based on the complexity and size of the inlay(s). Contact us for a price quote. Legend Guitars has been offering Dartmouth guitar repair and luthier services to Dartmouth, Halifax, Bedford, Nova Scotia and beyond for over 25 years.